Wash the clams very thoroughly under cool, running water. Discard any clams that have an odor. Drain and set aside. Over medium heat, heat the oil in a large saucepan (with a cover). Then add the chopped onion and cook until softened and translucent, stirring frequently. Then add the garlic and stir until fragrant. Add the wine, raise the heat to high, and allow the wine to simmer strongly for 2 to 3 minutes. Then add the clams and water, and cover the pan with its lid. Once the water reaches a boil, reduce the heat as needed to maintain a strong simmer (covered) until the clams have opened, about 10 minutes. Be careful not to overcook the clams or they will be tough. Discard any clams that do not open. Transfer 6 to 8 clams per serving bowl. Taste test the liquid in the pan and stir in 3 tablespoons of the butter. Taste test. If desired, stir in more butter, one tablespoon at a time, until you’ve achieved the desired consistency, richness, and flavour. Add freshly ground black pepper to taste. 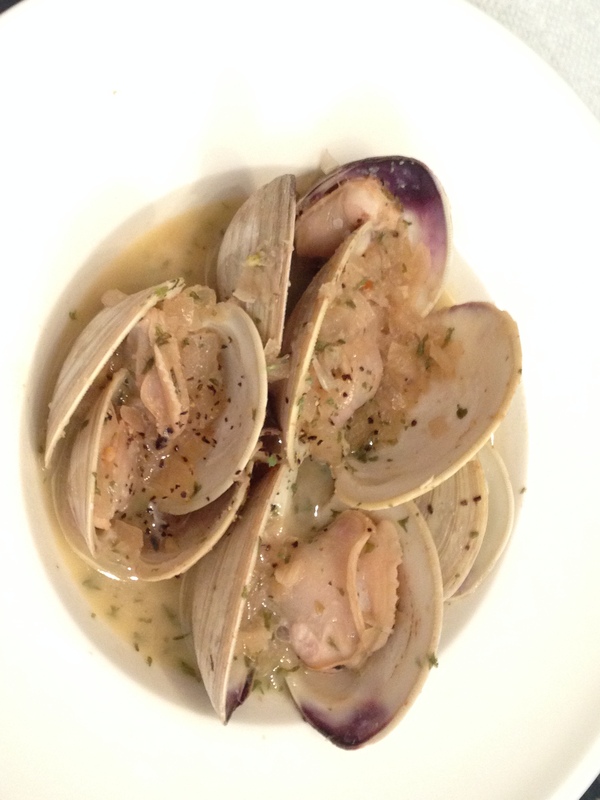 If the saltiness from the clams and butter is not enough for your taste, add some coarse sea salt. Pour the sauce over the clams, top with parsley, and serve immediately with sliced bread, if desired.